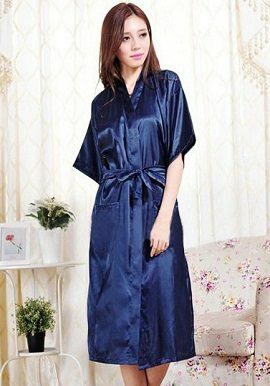 Wrap yourself in the ultimate luxury and comfort with the wide range of Robes Sleepwear Online at Sanzzyway. These robes offer extremely comfort and elegance. Made up of soft fabrics with clean detailing, the robes are the perfect addition to your lounge wear. Pick up the sexiest robes online India from the variety of colors and length . Feel softy and relaxed with the smooth crepe silk material . Crepe fabric is a light-weight and classic soft silk fabric with a good drape-ability.